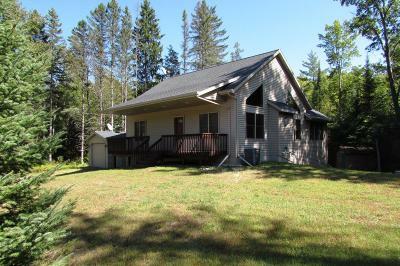 Quality Northwoods cabin close to boat landings fishing ATV and recreational areas. Three bedrooms (one in loft) 1 bath and over 1500 square feet with a detached one-car garage and a full basement. Custom cabinetry by Brown County Cabinets Casablanca hickory flooring in the loft plus Pella windows four-season room tongue-in-groove ceiling gutter guards and freeze alarm. Propane fireplace heats the house but there is also a GFA furnace. Central-air conditioning. Very energy efficient. Walk-out basement is stubbed for second bath. Electrostatic air clearer on furnace. Open concept with kitchen island. LP tank is owned. Chalk Hills Flowage and the Menominee River are nearby. Includes most furnishings and canoe.